In the original article, "The Dirt on Theistic Evolution", which I recommend reading before continuing with this one, I took theistic evolutionists to task for their inconsistencies on their claims to believe the Bible and their magisterial views of science. The creation account was the primary emphasis in that article. This time, I'm focusing on the Genesis Flood account. Old-Earth creationists, theistic evolutionists, Hugh Ross, and other owlhoots who want to compromise on what Scripture plainly says for the sake of "science" need to find some way to ignore the account of the Genesis Flood. They must wedge long ages into the Word of God so it appears to agree with current atheistic interpretations of scientific evidence. Biblical creationists uphold the authority of Scripture, and tend to be skeptical of old Earth science — especially when such science is full of bad logic and atheistic presuppositions. (For more about the science aspects of long ages, and evidence for a young Earth, there are many articles here.) If you study on it for a spell, you'll realize that biblical creationists are not expecting anyone to reject real science. Those long age interpretations are just that: interpretations. They are not facts, but opinions of what happened in the distant past. The Bible does tell us to believe anything that contradicts actual observed science (except in clear cases of miracles), or to disregard what we see with our own eyes. Old Earthers claim to believe the Bible, so they should have no problem with miraclous events: an axe head that floated (2 Kings 2:5-7), Jesus and Peter walking on water (Matt. 14:29), Jesus bodily rising from the dead (Luke 24:46-48), Philip casting out demons (Acts 8:6-7), Paul raising Eutychus from the dead (Acts 20:9-12), and more. But they holler "Whoa!" when it comes to believing the first eleven chapters of Genesis, especially Creation and the Flood. But the Flood is not written as myth or allegory, so it cannot be dismissed as such. People may rightly ask, "How can the Flood cover the highest mountains? There would be no air up there!" (I actually heard this objection.) First of all, air pressure would rise with the water, check your basic science. Second, the high mountains that we see today did not exist then. They were pushed up during and after the Flood, which helps explain the presence of marine fossils on mountains. Creation science Flood geologists have done extensive research on the changes in the Earth's surface due to the Flood, but those are beyond the scope of this article. People will use dubious long-age interpretations of secular historical science (and let's face it, we don't know everything about science), and then claim that Scripture is wrong. Not hardly, pilgrim! There is a special word for the Flood, mabbul, מַבּוּל, that only appears in reference to that Flood. Most references are in chapters 6-11 of Genesis, and once more in Psalm 29:10. God made his covenant with the Earth to never again destroy the entire world with a mabbul, and he used that word thrice in Genesis 9:11-15. 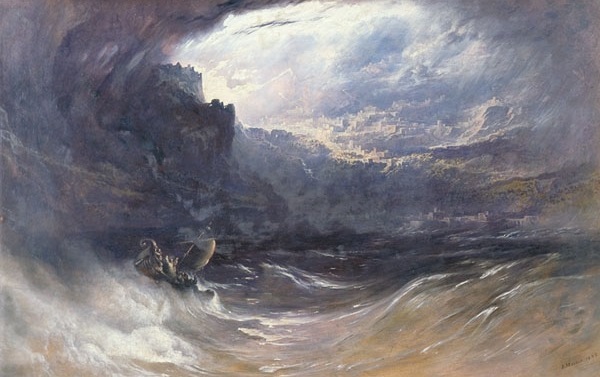 When the Flood is discussed in the New Testament, the Greek word kataklusmos, κατακλυσμός, is used (where the English word "cataclysm" came from). Special words for a special event. If people want to make the Flood into some kind of local event, then they are making God a liar, since there were obviously many local floods over the years. Riding the trail up yonder into the New Testament, we find that Jesus referred to it as an actual historical event (Luke 17:26-17) and the writer of Hebrews told us that Noah and the Flood were real (Heb. 11:7). Peter followed Jesus' example, referring to the Flood as not only a past judgment, but likened it to the coming final Judgment, and telling us what we see now: mockers will come along (2 Peter 3:3-7). Peter adds that the first Flood was with water, but the final Judgment will be by fire. Will that be a local incident, too, nay-sayers? For people who claim to believe the Bible, I ask this: Who are you going to believe, the ever-changing whims of man-made science philosophies, or the Word of God? God is holding off on that last Judgment to give people time to repent, whether false teachers, those who are deceived, and those who are rebelling against God. But there will come a time when it's all over, and there will be no second chances.